When Armani launches a fragrance it’s big news. BIG news. That’s because Armani fragrances regularly feature in the world’s top ten fragrances in terms of sales and that means plenty dollah, baby. Armani is the number two fragrance brand in the UK behind Chanel. You only have to look to ‘Diamonds’ to see the phenomenal success it’s been for Armani and we all know that’s fronted by bootylicious Beyonce. It’s in this light that Giorgio Armani has chosen to release Acqua di Gioia (pronounced Joya) and provide the legions of Armani fans with a fresh, light, Summer themed fragrance that’s got hit written all over it. Add a global advertising campaign fronted by stunning, 19 year old Emily di Donato and hey presto – another entry into the global top ten of fragrances. I don’t say that lightly but because I think Mr Armani is on a winnng streak with this one. Acqua di Gioia isn’t necessarily my cup of tea (with lemon) but it has a universal freshness with popular appeal that’s right for holidays or to add freshness to city living. For want of a better description, there’s a wide appeal, common touch here that will infer it with superstar status for years to come…the Madonna of fragrances if you will. That doesn’t mean to say that everyone will like it. They will recognise it, though, and that, my friends, is the sign of a classic. Fresh, light, sultry and rainforest soaked, the fragrance bursts onto skin like being sprayed with perfumed rainwater in a chic city hotel bar..which it kinda was at the recent launch in the sumptuous penthouse apartment of The Soho Hotel. You can imagine big plush, splushy raindrops soaking you in this scent on a hot day. Men seem to love it as it smells feminine and intriguing. Mr Armani and his trusty team of top class parfumiers (Loc Dong, Anne Flipo and Dominique Ropion) hit the ‘tick’ box again as it’s cross gender appeal shines through. Fresh Mohito top notes burst with joy and are teamed with crushed mint leaves, limona primo fiore and aquatic green accord. The air if of the seductive power of the sea and of flowing water. In fact, Mr Armani was inspired by the geography of his homes in Pantalleria and Antigua and wanted to develop a fresh, joyful fragrance that evoked freedom and the natural elements – where land meets sea. Heart notes cut through the wetness with spicy pink pepper, jasmine sambac, and peony while the base notes have cedar wood heart, labdanum (for a hint of incense) and brown sugar accord. Acqua di Gioia can be best described as a very ‘wet’ fragrance. It feels, smells and bursts with jets of watery freshness while soaking the wearer in Armani’s trademark sophistication. For first time devotees of Armani, this isn’t a bad way to start. May it bring you joy. 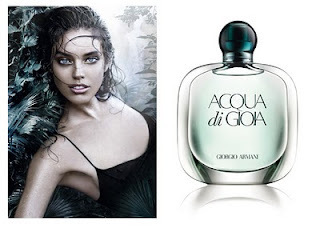 Acqua di Gioia is available in selected department stores from July 2010. Previous post: Art and about – A normal Noho night out. Next post: iPad covers for chic geeks.